Grand Excursion Preview - Potosi to Cassville, Wis.
From the Wisconsin-Illinois border to Cassville, Wis., steep rocky bluffs and black-dirt bottomlands line the Mississippi. From the river, the endless wooded banks and islands seem remote and wild. Traveling by car on one of the few roads, you see bluffs flirting with rolling prairie farmland punctuated by small towns. Each small town has something unusual to brag about. 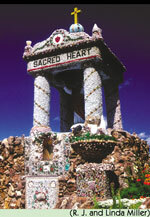 Dickeyville, Wis., about 12 miles northeast of Dubuque, Iowa, is home to the Dickeyville Grotto, a shrine made from concrete encrusted with glass shards, shells, costume jewelry and other bric-a-brac. It was built by Father Mathias Wernerus between 1925 and 1930 and celebrates both religious and patriotic themes. Potosi and Tennyson, Wis., grew up as twin lead-mining villages during the 1820s, when miners living in burrowed hillsides gave Wisconsin its nickname, the Badger State. Earlier, the Winnebago indians mined lead there as well. Potosi was named after the Bolivian mountain, where miners have dug gold and silver for centuries. At Potosi Station, on the river below Potosi, lead was loaded onto riverboats at the end of a narrow neck of land extending out to the Potosi Canal. Visitors can check out a real lead mine at St. Johns Mine museum in Potosi. Opening in 1852, the Potosi Brewery helped to quench the thirst of hungry miners and was known throughout the Midwest until it closed in 1972. The Potosi Brewery Foundation is working to restore the old brewery building and open a restaurant and micro-brewery there in three to five years. The Grant River Recreation Area, managed by the Army Corps of Engineers, is just downriver from Potosi Station. You can see 43 ancient burial mounds at the Turkey River Mounds State Preserve in Iowa. Take US Highway 52 to the first eastbound gravel road north of the Turkey River bridge to the marked parking area. Walk back down the road to an unmarked trail up the steep bluff. Follow it to the top for a fabulous view and mounds dating from 500 B.C. No bridges span the 54 miles of river between Dubuque and Prairie du Chien, Wis., but you can cross on the Cassville Car Ferry, the only ferry on the Upper Mississippi. In Iowa, from US Highway 52, follow the eastbound gravel road C9Y near Millville, south of the Turkey River, through the bottoms to the Mississippi. 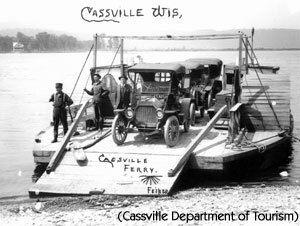 From the Turkey River landing, the ferry travels downsteam about one and a half miles to Cassville, Wis. The ferry barge is powered by the towboat Charlie D. It operates Wednesday through Sunday, Memorial Day to Labor Day, and weekends in September and October. Its a good idea to call (608) 725-5180 and verify the schedule. For more than 50 years, Cassville has celebrated multiple births during its annual Twin-O-Rama festival in mid-July. History buffs, hikers and campers will enjoy the Nelson Dewey State Park and historic Stonefield Village, upstream from Cassville. Named after Wisconsins first governor, the state park offers great views of the river. Stonefield Village, a living history museum, recreates a 1900 farm and village, and includes the Nelson Dewey estate.